Discussion in 'Unreleased Games Discussion' started by Anthaemia., Jan 22, 2012. 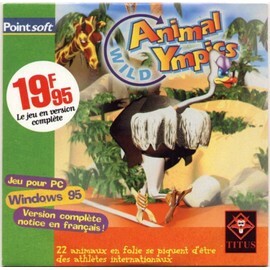 I was recently going through a large number of magazines from the PlayStation and Saturn era when I came across an article about a multiplatform game called Animalympics. From what I can gather (due to the original text being in a foreign language that isn't one of my strongest points and translation tools not providing much in the way of help), this was either being developed or published by Titus. If it was released it wasn't on the Saturn. That sort of shovelware was all too common on the PlayStation in Europe so it may have been released on that but I can't say I ever saw it. They were probably thinking about porting it over, but it didn't happen by the looks of it. Cheers for that - I think it's safe to conclude any PlayStation or Saturn version of this was simply going to be a port of the PC game. yeah remember that game with the name 'Wild Animal'ympics'. Can you upload the scan anyway? I've got a scan from a SEGA Power news bits somewhere..
Also in Consolemania issue 56 there is an article about the game with three shots ( different from Anthaemia's article ). I have the pc game and believe me, you DON'T want to try it!